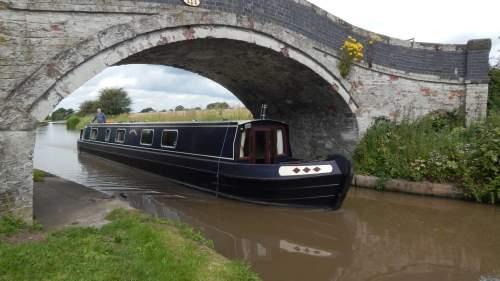 Design : The Adele Marie is a 58 foot Cruiser stern 6 berth narrowboat with easy to use controls. Water cooled diesel engine. 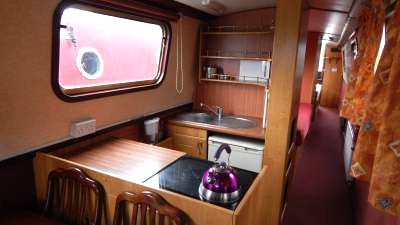 Features : There is full radiator heating on board, also there is a Wood Burning stove in the saloon and a bag of coal, kindling, firelighters and matches are provided. A water tank supplies the hot and cold running water. The floor is carpeted and the boat has many home comforts. Saloon : Colour TV/DVD player, CD/Radio. Kitchen : The kitchen is fully equipped and has a 4 burner gas cooker with grill and oven; refrigerator with icebox; sink and drainer; saucepans; cooking utensils; crockery and cutlery appropriate for the number of berths. There is plenty of storage space and work surfaces. Cafetiere supplied. You can pre-order things like bread and milk. 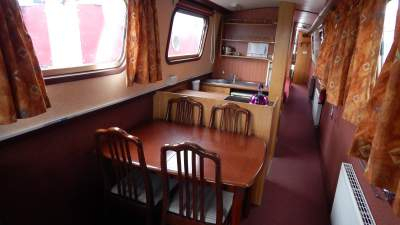 Berths : Adele Marie has 2 cabins, one with a fixed double, and one with 2 singles or can be converted to a double, also if needed the saloon has a pull down double sofa bed. Bedding : Freshly laundered bedding is supplied for each crew member, as per your requirements. Additional bedding is available on request. Towels are also supplied - one medium sized towel and one hand towel per crew member. Shower Mat also provided. Bathroom : The bathroom comes with shower with full length bi-fold door, toilet and sink and shaver point. Electric : There is a standard 12v mobile phone charger. Welcome Pack : A Welcome pack is provided consisting of washing up liquid, tea-towels, tea/coffee/hot chocolate/biscuits/ toilet roll. Additional Information: A safe is supplied on the boat and umbrellas. Tuition and life jackets are supplied free of charge.